How retro: In this era of electronic trading, an outfit called Box Options Exchange wants to open an old-fashioned trading floor in Chicago. 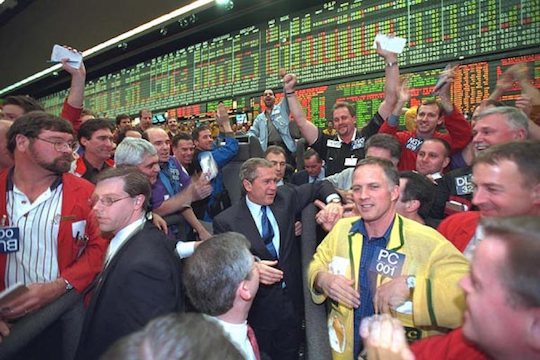 As we mentioned yesterday, Alan belongs to the last generation of traders who remember when “open outcry” was the main way business got done in the stock and bond and futures markets. He was elbowing for position with the best of ’em at the Chicago Board of Trade. … but in 2015, the exchange’s parent CME Group closed most of its futures trading pits. Box Options Exchange figures there’s still a niche for open outcry in the options market, “where investors sometimes prefer human traders to execute complex orders rather than computer programs,” explained The Wall Street Journal yesterday in a front-page story. But Box’s plans are running into resistance from the established players: The Chicago Board Options Exchange, the New York Stock Exchange and the Nasdaq are all urging the SEC to turn down Box’s proposal; a decision is due by early next month. Whatever the outcome in this one isolated instance, the die is cast: “The days of the floor trader are coming to an abrupt end,” says Alan. “For hundreds of years the order route was the same,” he explains. “You called your broker with a buy or sell, the broker called a desk on the floor, a phone clerk wrote the request on a ticket, a runner ‘ran’ the trade to the trading pit where a broker would execute the trade, an endorsed filled order card was grabbed by another runner and brought back to the desk, a phone call was made to your broker and they in turn called you with your confirmation. So what’s it to you? Everything. “The disappearance of the floor means nobody has an advantage anymore,” Alan goes on. For maximum success in this new era, says Alan, “You simply need two things. “First, you need to know what to trade. A floor trader was limited to one market. The boys’ club had hard rules. A corn guy could only take advantage of whatever opportunities or not that they had in that particular pit. Gold was its own game, and so on. “Now? Anybody and everybody can trade in any market anywhere anytime. Money never sleeps… It moves around the globe at lightning-fast speed to meet the need of greed. But from that multitude of options, how can you possibly choose? That brings us to the patent-pending tool to which Alan has access — a trading system that telegraphs big price moves before they happen. And it does so week after week after week. Gains of $5,290… $10,200… up to $35,700. During a special online briefing tomorrow at 1:00 p.m. EDT, Alan will show you how to tap the power of this revolutionary trading system. It won’t cost you a thing to watch; just RSVP at this link and we’ll be sure to save you a spot. It’s another sleepy summer day in the markets. The Dow and the S&P are down fractionally, the Nasdaq up fractionally. Treasury yields are likewise little moved, the 10-year at 2.37%. Gold is stuck at $1,213. Crude prices are firming a bit, though, a barrel of West Texas Intermediate now fetching $44.77. “The culprit for recent weakness in gold is easy to find,” says Jim Rickards. “It’s higher real interest rates. “Real rates are simply nominal rates minus inflation. Real rates are rising based on both parts of that description. Nominal rates are rising because of Fed rate hikes and market reaction to last week’s strong jobs report. Inflation is dropping because of Fed rate hikes, which come at the worst possible time for the economy. But Jim says it can’t last. The economy is slowing perceptibly — thanks in large part to the Fed’s three rate increases since December. The Fed continues to make “hawkish” noises, but, “The next move, probably by late summer, is toward Fed ease through forward guidance, lower nominal rates, higher inflation, lower real rates and much higher gold prices. Gridlock in Washington is putting a damper on the enthusiasm of small-business owners, judging by the latest Optimism Index from the National Federation of Independent Business. The June number rings in at 103.6. It’s been creeping down from a 12-year high of 105.9 set in January. Without progress on Obamacare repeal and tax reform, there’s nowhere for the number to go but down. Meanwhile, the tightness in the labor market might be easing a bit; 15% of survey respondents said finding qualified help is their single-most important problem. That’s down from 19% the month before. Recreational marijuana became legal in the state on July 1. Demand has been so intense that by July 7, last Friday, the Department of Taxation issued a “statement of emergency,” which was promptly endorsed by Gov. Brian Sandoval. The practical result of the “emergency” declaration? This coming Thursday the Nevada Tax Commission will decide whether to lift its cap on the number of distribution licenses it issues. Right now those licenses can be issued only to existing alcohol distributors. Never underestimate the power of the booze lobby, huh? “Dave, you need to adjust your sights and quantify what you mean when you speak about the demise of the defined benefit plan,” a reader writes. “Indeed, many large Rust Belt companies, state and local governmental non-ERISA plans and unions have used the ‘hide the pea’ routine to pass along ‘cashless’ compensation manifested by hyped-up interest assumptions. Now with benefit promises outstripping trust assets to pay them, everyone is looking around with long faces wondering how this sorry circumstance could have visited upon us. “In fact, the largest growth segment of the retirement plan business by percentages is not the 401(k) plan. It is the cash balance plan. Since 2006, cash balance plans have grown from 3,893 to over 15,000 today. These plans are hybrid defined benefit plans that look like a defined contribution arrangement but have contribution limits that act like a defined benefit plan. IRS regulations promulgated in 2010 have pushed along growth. The 5: True enough, cash balance plans are a boon for older business owners running behind on their retirement savings. The annual contribution limits put a 401(k) to shame. But a payroll employee approaching retirement age who suddenly gets switched from a defined benefit plan to a cash balance plan might not be so happy. A DB plan’s benefits are usually based on the final few years’ salary before retirement; a cash balance plan takes all working years into account. For younger workers, though, cash balance plans do have the advantage of portability. Move on to a new job and you can roll over the cash balance plan from an old job into an IRA. P.S. In less than 24 hours, Alan Knuckman unveils our new “7-Day Fortune” formula. As an Agora Financial reader, you have exclusive access to this online event. It’s tomorrow at 1:00 p.m. EDT. Alan will reveal a revolutionary strategy allowing you to turn the tables on Wall Street’s elite… while supercharging your retirement savings. This event is absolutely FREE, with no obligation. All we ask is that you sign up in advance, so we know how many people to expect. The free sign-up link is right here.